Neil Young's electric guitar sound has been described as like "a jet plane in a thunderstorm" and those who have witnessed and directly felt in their chest the aural assualt that is known as "Crazy Horse-style" know that which we speak. Over the years, we've seen and heard quite a few Neil Young enthusiasts try and replicate his unique sound, with various degrees of success. Lately I've been searching on how to get that open, big, heavy, unpredictable Neil Young's guitar sound. There have been few threads regarding my question, but nothing concrete. I am not interested in what he used to get it. Buying the exact same gear is used/uses is pointless. The particular sound I am interested in is the electric guitar sound from the movie "Dead Man". First for me - you won't get to that guitar sound without approximating the signal chain. There are many suggestions above - but none of them sound like 'that' guitar track. If you really want it - you should run down the wiggly Young path and start hunting for wrecked equipment such as below. From the sound of everything I imagine everything he's plugging into is out of specifications - and probably teetering on the edge of blowing up. Larry Cragg if fond of saying Youngs Guitar and Rig are a trainwreck waiting to have already happened. Old Blackie is a 53 Goldtop that now has a Firebird Mini Humbucker in the Bridge Position and a late Metal covered P90 neck Pickup most likely borrowed from a Gibson ES330. The neck was reported to have been replaced by Gibson in the 1960s with one of the SG Les Paul Necks. Young had a mini toggle switch installed in the middle of the controls - what it does is send the pickups directly to the output jack bypassing the controls. That is what I believe is at the crux of why that guitar sounds so good. If you look at the back of Blackie - there is a round aluminum disc underneath where the bridge is situated on top. I've hear rumor that their is some kind of Cragg built string locking mechanism in there. The sound on the track you cited - is probably the bypassed pickups into an overdriven Tweed Fender Deluxe biased to 6l6 tubes (and he uses those older Bottle type) with his 'Whizzer' attached. His Current Whizzer controls three knobs - and has several presets positions to get that 'Young Sound'. From the sound of this track I'll bet Young is running the output of the Deluxe into his Magnatone Stereo 2 x 12 ( not the amp just the speakers).He's known to use both an EP2 Tube Echoplex and possibly a MXR Analog delay. The EP2 is famous for the tube distortion produced (and for being extremely finicky) - and the MXR has a long history of sound cool when pushed (often attributed to the transistors used). Also At the end of that track he's got some kind of Octave Divider going on. Through it all Young sure gets some magic going - even the bass farting lows have a very musical quality - and the lead notes are very dynamic. More on on The Gear Page | Discussion in 'Effects, Pedals, Strings & Things' - "How to get Neil Young's sound?". 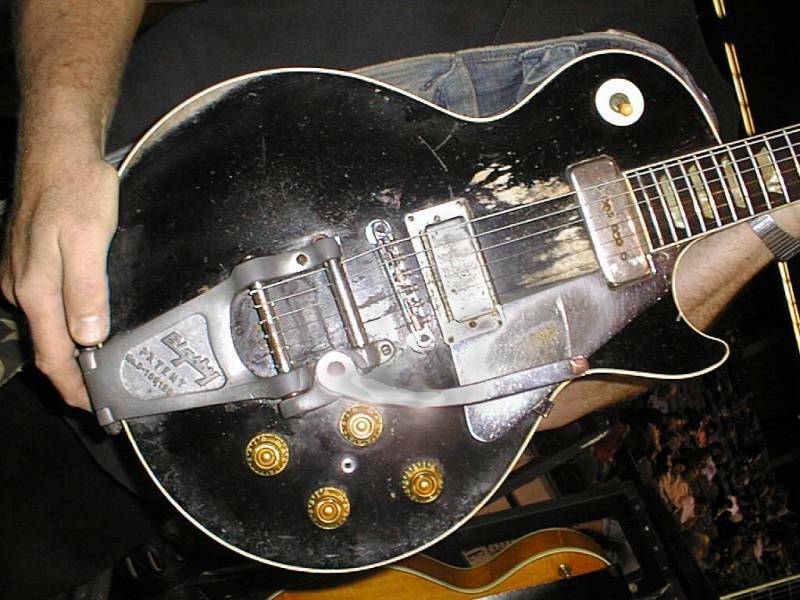 Neil Young's Les Paul Guitar "Old Black"
Also see, a collection of articles on Neil Young's Guitars, Amps, Whizzer and Equipment on how he obtains his unique grunge and feedback sound. Also, more on the film Dead Man (1995), directed by Jim Jarmusch. If your trying to recreate Neil's sound, good luck. It's not just a sound that he creates, it's an environment. And that environment is toxic. It's like riding a roller coaster on acid, it's like the free fall of a parachute jump. It's like being cradled in the arms of god. It's flying to the moon at hypersonic speed and the weightlessness of a spacewalk. If you can recreate that, you've got it. But I must warn you, no one recreates Jimi Hendrix, and for damn sure......no one recreates Neil Young! It's also warm and fuzzy! @ Old rocker Dave - quite a vivid description of Neil's sound ... in particular, " It's flying to the moon at hypersonic speed and the weightlessness of a spacewalk" nice. You can't reproduce or imitate a masterpiece. It will always be an imitation or reproduction. But nice try. Really, really nice try. I think there are only a handful of people who can pull it off, but it still isn't the same. It would be boring if it was. @MNOTR - boring indeed. But we don't have to worry about that around here, that's for sure. Never a dull moment @ TW. 2 Grab a tube amplifier with a "Spongy" sounding power section. A old Fender amplifier. 3 Overload said amplifier by hitting it with a boost, an overdrive or simply turn it up to full. 4 The rest is in the touch. You have an overloaded signal. It is very responsive. Requires fine adjustments note to note. It's so overloaded, that if you hit it hard, it comes in like a blooming swell and does not hit quite as hard. If you want it big, you have to almost back off a bit. It is all touch. And timing. It is like ike trying to put cream in a cup of coffee by gently tipping a 10 gallon, ceramic cream jug. When it's working, it's like making out on the couch with a fire breathing dragon. @ Llyod - cool son you got there. Big congrats and takes a cool dad to have a cool son.